Jill was 35 when her mom Ann died. Ann had been undergoing treatments for breast cancer. Jill thought her mom was doing well, and was excited that Ann planned to visit her in Florida in the fall. Then one Monday afternoon in June, Ann learned the cancer had spread to her liver. By that Friday, she was dead. Jill was in shock. Her whole world began to move in slow motion. Her body felt like it was being held down by 50 pound weights. Her mind raced through a list of things she should have said to her mom while she was still alive. She continually replayed their last dinner together and felt guilty about not being more present during their conversation. Her work and home life began to suffer. Jill was experiencing many symptoms of grief. Her friend suggested that she sign up for a local grief support group to help get her through this trying time. No one wants to need a support group. It might make you feel weak, vulnerable or dependent. But joining a group can bring you hope and strength to carry on. Grief is a natural, healthy, and universal emotion that helps us accept loss and begin to heal. It’s the emotional and physical response we have when someone we know dies. Grief is complicated. It’s an intensely personal experience that each of us feels, and deals with, in our own way. You could experience feelings of shock, loneliness, anger, guilt, confusion, and fear. You could feel fatigued and shaky. You might experience headaches and stomach problems, or have a hard time eating, sleeping, and focusing. Sometimes, you might even think you’re going crazy. It’s especially hard when others seem to be setting artificial time limits for your grief – offering their expectations for when you should have dealt with your pain and moved on. But the encouraging news is you don’t have to grieve alone. Grief support in South Jersey is available for you and your loved ones. Understanding and trained professionals are available to guide you through the grieving process. Validation: People react to grief in different ways with varied emotional, physical and spiritual responses. A grief support group can confirm your experiences are normal. You can receive support from others who know first-hand what you’re going through. Emotional respite: Support groups can provide you a break from the loneliness that often accompanies grief. Joining a group can also provide you the freedom to express negative feelings that you might not feel able to family members coping with their own grief. By sharing, you can experience a sense of emotional relief. 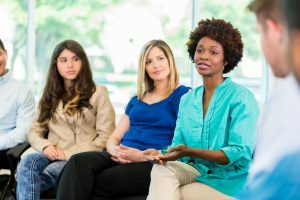 Ideas for coping: You can share how you’ve dealt with various challenges and listen to others who can add insight and potential solutions to your problems – all within the safe haven of a group guided by a professional counselor. Don’t forget, just as you benefit from the group experience, another member might benefit from hearing your story. Helping others might help you. Many hospice organizations provide local grief support groups for the community, whether one did or did not use the hospice’s services. Funeral homes, hospitals and places of worship also can connect you with grief support groups and other resources. In addition, national grief support organizations have local chapters that host support groups. I’m nervous about meeting new people. I’m anxious about stepping outside my comfort zone. I’m shy about telling others about myself. What if they ask me to talk?! 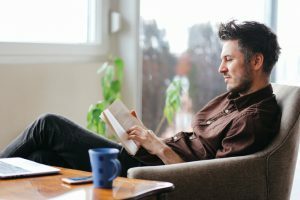 A lot of people experience social anxiety, especially since you’re already feeling out of sorts from the loss of your loved one; however, connecting with other people in similar situations has been shown to have healing effects on mind, body, and spirit. It’s worth pushing yourself to give a support group a try. Remember everyone is there for a specific reason – and in many cases it’s because of a similar experience to yours. 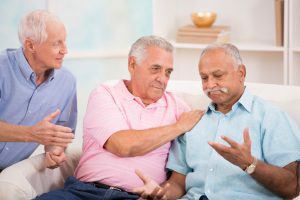 Samaritan offers a wide range of grief support groups in southern N.J. that focus on different types of loss – such as a spouse, child, parent, other relative, friend, or pet. We offer distinct groups for men, women, young adults, preschool-age children, and those affected by suicide. Sessions are available in Marlton (Evesham), Mount Holly, and Haddonfield. For a list of Samaritan support groups, please visit our Support Groups page. Option B by Sheryl Sandberg is a New York Times best-selling book. After the unexpected passing of her beloved husband, Facebook COO and bestselling author of Lean In, Sheryl Sandberg, feared that she and her children would never find joy again. Fortunately this fear was unfounded. Option B: Facing Adversity, Building Resilience, and Finding Joy–co-authored with psychologist and friend Adam Grant–shows you how Sandberg, and many others who have overcome a wide range of profound hardships, triumphed over tragedy. I Wasn’t Ready to Say Goodbye: Surviving, Coping, and Healing After the Sudden Death of a Loved One by Brook Noel and Pamela Blair, PhD. Now for these who face the challenges of sudden death, there is a hand to hold, written by two women who have experienced sudden loss. This updated edition of the best-selling bereavement classic will touch, comfort, uplift and console. Authors Brook Noel and Pamela D. Blair, Ph.D. explore sudden death and offers a comforting hand to hold for those who are grieving the sudden death of a loved one. On Grief and Grieving: Finding the Meaning of Grief Through the Five Stages of Loss by Elisabeth Kubler-Ross and David Kessler. Ten years after the death of Elisabeth Kübler-Ross, this commemorative edition of her final book combines practical wisdom, case studies, and the authors’ own experiences and spiritual insight to explain how the process of grieving helps us live with loss.